I´ve fallen a bit behind on the Pagan Blog Project. I haven´t felt inspired and I haven´t come up with any subject I´ve wanted to write about. 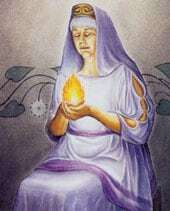 But now I decided to research the goddess Hestia a bit, and write a poem, short and sweet! Perhaps it can also be seen as an evocation. Enjoy (hopefully)! This entry was posted on April 14, 2012 at 6:10 pm and is filed under Pagan Blog Project, Poetry with tags Hestia, Pagan Blog Project. You can follow any responses to this entry through the RSS 2.0 feed. You can leave a response, or trackback from your own site.